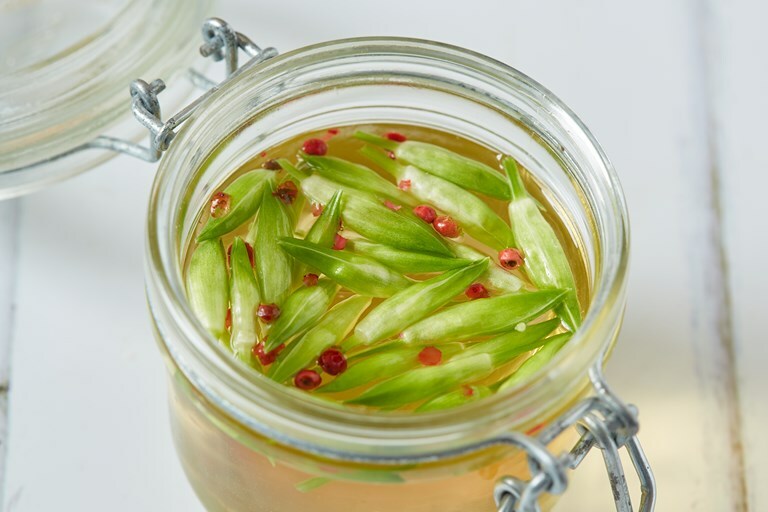 Wild garlic season only lasts for a few months, but this pickled wild garlic bud recipe allows you to preserve the incredible flavours for the future. A simple pickling liquor is used to submerge the buds of the flowers, which can then be kept in a sterilised jar. Perfect for scattering over salads or stirring into sauces. This quick pickle recipe is a great way of preserving the wonderful but fleeting wild garlic season. The sweet and sour pickle liquor balances out the sharp raw garlic taste and a pinch of pink peppercorns enhances the leaves' floral flavour. Feel free to play around with different flavourings; a sprig of thyme or slice of fresh turmeric both work well. Try them in a buttery sauce for a nice piece of white fish, or simply brighten up a salad by scattering a few buds over the top.